Ruim appartement. Schoon, alles aanwezig. Vriendelijk eigenaar. Where to find Lido di Ostia hotels near an airport? How can I find hotels in different Lido di Ostia neighborhoods? Where can I find hotels in Lido di Ostia that are near tourist attractions? 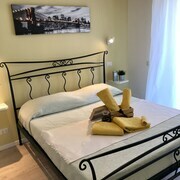 If you are deciding on where to base yourself in or around Lido di Ostia, you'll find a wide array of comfortable options to choose from. Spend some time perusing Expedia's 52 hotel options, which are all within a 0.1-kilometre (0.06-mile) radius of Lido di Ostia's center. 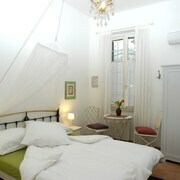 Looking for a hotel in 3 kilometres (2 miles) of central Lido di Ostia? La Dolce Sosta and La Riva is sure to suit your needs. 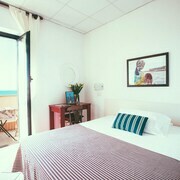 The Hotel La Scaletta is positioned 2 kilometres (1 mile) away from downtown Lido di Ostia and is a sensible choice for visitors who like to save money wherever possible. Another economical option in this area is the Sirenetta. 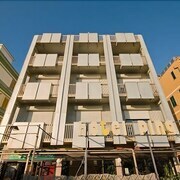 25 kilometres (16 miles) away from the heart of Lido di Ostia, is the Rocco Forte Hotel De Russie. Alternatively, the Kaire Hotel can be found 25 kilometres (17 miles) away. The Manfredi Luxury Apartments and the THE FIRST Luxury Art Hotel Roma are alternative Expedia-listed hotels in Lido di Ostia. The broader Lazio area is definitely worth visiting also. Lazio boasts beaches, coastal plains and lakes, and common Lazio attractions include ruins, castles and traditional villages. Popular things to do in this part of Italy include snowboarding. Looking for more to do? Why not spend some time enjoying Parco Pier Paolo Pasolini and Associazione Culturale Affabulazione, in Ostia, 5 kilometres (3 miles) to the northeast of Lido di Ostia. 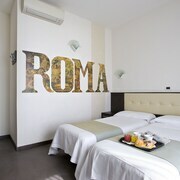 Expedia-listed Ostia hotels include the Hotel Giulietta e Romeo and Villa Flaminia. 25 kilometres (15 miles) to the northeast of Lido di Ostia, you can also stay at Navona, which is home to the Hotel Eden and Grand hotel via Veneto. The San Salvatore in Lauro and Roman Jewish Ghetto are a couple of the most popular places to experience when you're in Navona. Why not spend a few hours rubbing shoulders and cheering along with fellow sports fans at a local sporting fixture. You'll find Olympic Stadium 25 kilometres (17 miles) to the northeast of Lido di Ostia. 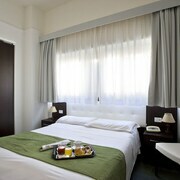 Sleep close to the action at the Palazzo Manfredi - Relais & Chateaux or the Baglioni Hotel Regina. If you are traveling into or out of Leonardo Da Vinci Airport and plan to stay nearby try Hilton Rome Airport or Hotel Seccy. What are the most popular Lido di Ostia hotels? Are there hotels in other cities near Lido di Ostia? 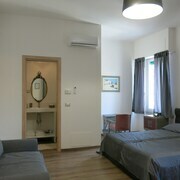 What other types of accommodations are available in Lido di Ostia? Explore Lido di Ostia with Expedia.ca’s Travel Guides to find the best flights, cars, holiday packages and more!